I'm feeling a little under the weather today, but I should be up to full strength soon. In the meantime, here's a recent commission. Now to do what I do best: sleep! Hope you get better soon, man. Campell's Homestyle Chicken Noodle Soup. With a splash of Lemon. What was your selected medium for this piece? Thanks, Alejandro. I'm feeling much better now. Jason, this was done with a sepia gouache underpainting, followed by Acryla Gouache. Damn, I love this. 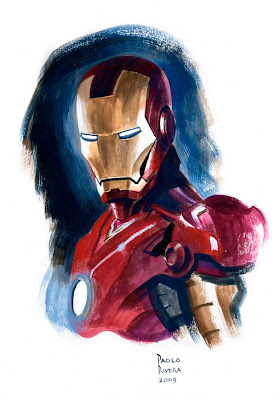 Iron man looks so fun to paint. Thanks, Eric. I've actually been dying to paint him again for Marvel. I told my editor to give me a call as soon as the current Iron Man armor switches back to the circle chest light (I don't care much for the pentagon).